xmllint is used to parse clickhouse's config file, which is an XML. xmllint is included in libxml package, so you may need to install it. ClickHouse monitoring template is available on github. or download two files, one of which is a monitoring script, the other is Zabbix template XML file. Now, having template and monitoring script locally available, we can setup Zabbix configuration. zbx_clickhouse_monitor.sh is a monitoring script, which is in charge of fetching monitoring data samples from clickhouse being monitored. /PATH/TO/zbx_clickhouse_monitor.sh depends on where you've cloned template's repo. HOST_WHERE_CLICKHOUSE_IS_RUNNING is an optional parameter which tells what clickhouse instance are we going to fetch data from. In case none specified localhost would be used. 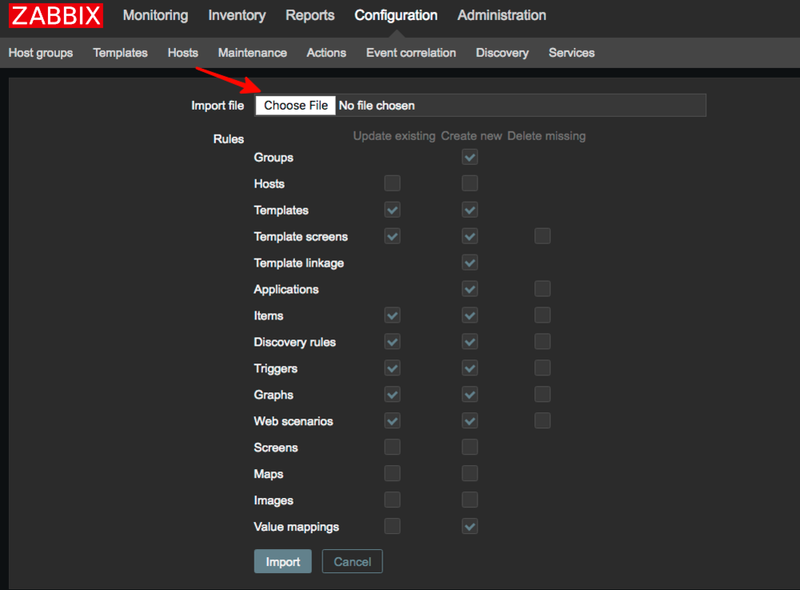 Click Import That's it - now ClickHouse monitoring should be availbale and new Graphs with ClickHouse data should be added. It is easy to setup ClickHouse monitoring with Zabbix by using Altinity's Zabbix template. Give it a try!